HomeAll articlesInertial Systems, MotionSTIM300 Tactical Grade IMU, NEW revision released! Successfully in use with multiple defense and commercial applications. 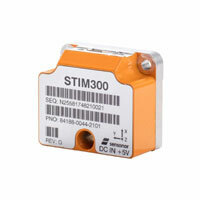 STIM300 Tactical Grade IMU, NEW revision released! Successfully in use with multiple defense and commercial applications. Meet Sensonor at Eurosatory in Paris June 11 to 15, Hall 6 F304. Sensonor: STIM300 Inertia Measurement Unit, the smallest, lightest and highest performing commercial MEMS IMU in the market. NEW features include reduced startup time <1 second and IRBS of 0.3°/h. STIM300 is a cost effective ITAR free solution for systems that only had FOG's as an alternative when reaching for the performance level that STIM300 can offer. Sensonor will have STIM300 on display to test how stable you are.